On the cover: Mario, the superstar New York plumber who has sold 165 million games for Nintendo, rushes into action to save his company's fortunes. JPY1 billion from the government to answer Japan's question of the moment: "Where did it all go wrong?" Mayumi Saito finds ova banks operating in Japan, despite questionable practices. Author and economic commentator Eamonn Fingleton describes the brilliant diplomatic game Japan has played to keep the US at bay amid its current wars. The fabric industry tackles the invisible threats of technology with innovative materials and designs. Japan is notorious for mystifying addresses. No wonder they are leading the way forward in wireless car navigations systems, and selling them to the US. Misguided political elites, misappropriated policies and the domestic and foreign media are the targets of Gregory Clark's rage. Is karaoke irrelevant to cellphone culture? As the industry woos an aging demographic, it looks increasingly desperate. Kansai columnist Dominic Al-Badri traces the history of the region's globally ubiquitous postmodern invention: Instant ramen. As Japan renews its quest for whaling rights on the eve of this month's International Whaling Commission meeting in Berlin, Debbi Gardiner asks why the nation is singled-out for blame by anti-whaling forces -- and why it remains relentless. Game giant Nintendo is best known for being clever and cute. But, as Leo Lewis discovers, the company is now struggling to survive fierce competition. Can it match the needs of mature gamers? In London, Lewis meets the company's creative genius, Shigeru Miyamoto, to find out. 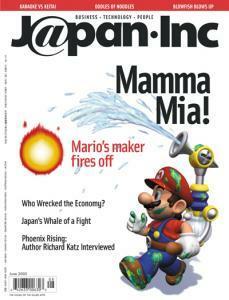 THE EXTRAORDINARY SUCCESS OF Nintendo's characters has turned their creator, Shigeru Miyamoto, into a global megastar. In an exclusive interview, Richard Katz, author of Japanese Phoenix: The Long Road to Economic Revival, argues for Japan's economic revitalization against the odds. An Excerpt from Richard Katz's Japanese Phoenix: The Long Road to Economic Revival. Our scaly resident crank sounds off on whining salarymen, health food freaks and a whole lot more.